Washington, DC (January 30, 2017) Claudia Woods recently returned to ForrestPerkins to lead the New York City Design Studio. Throughout her career, Ms. Woods has been responsible for the creative direction and project management of numerous prestigious commercial projects. Her extensive portfolio includes hotels, restaurants, spas, residential, office, and retail projects. “It’s an exciting time to be rejoining ForrestPerkins as the firm is expanding into the New York City market,” said Claudia Woods, Associate Principal of ForrestPerkins, who brings a great deal of expertise in the design of Food & Beverage venues. “Claudia is a highly creative interior architect and designer whose work sparkles with vitality and sophisticated detail. She is also a strong leader who inspires others and excites clients with her vision. 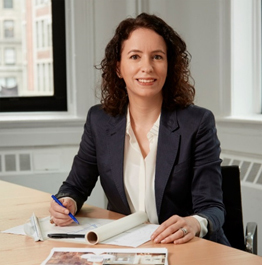 I am pleased to welcome Claudia to our New York studio as she returns to ForrestPerkins,” said Deborah Lloyd Forrest, FASID, ISHC, President of ForrestPerkins, a distinct design studio of Perkins Eastman. Most recently, Ms. Woods, a registered architect in New York, led the renovation of the iconic New York City landmark, Blue Water Grill on Union Square. She co-led the Studio at Starbucks Design East in New York City earlier. While at Starbucks, Ms. Woods led the design of 400+ store locations in the Northeast each year, including Reserve, Starbucks’ new high profile stores. Ms. Woods was honored with Starbuck’s President’s Award and Bravo Award. She also designed CBD Provisions Brasserie Restaurant at The Joule Hotel in Dallas, Texas. Ms. Woods was the lead designer for the F&B venues and Spa at the St. Regis Amman Hotel in Amman, Jordan, when she previously worked at ForrestPerkins. Earlier in her career, Ms. Woods was an Associate at Rockwell Group, where she was responsible for hospitality projects including Danny Meyer’s Maialino trattoria at the Gramercy Park Hotel in New York City, Alain Ducasse’s Adour at the St. Regis Washington, D.C., and Nobu Matsuhisa’s Nobu in Budapest, Hungary. Previously, Ms. Woods was Project Manager for Yoo USA, Philippe Starck’s residential design and development firm, and Project Designer for Clodagh Design on the W Fort Lauderdale. ForrestPerkins merged with international design and architecture firm Perkins Eastman on January 1, 2016, and remains a distinct design studio. ForrestPerkins, founded in 1998, provides the highest quality interior design and architectural services to the owners and operators of luxury and landmark hotels and prestigious multi-residential projects throughout North America and internationally. With design studios in Dallas, Texas, San Francisco, California, Washington, DC, New York, New York, and Dubai, UAE, ForrestPerkins delivers exceptional designs for owners of luxury hotels, resorts, and branded residences with names including St. Regis, Ritz-Carlton, Four Seasons, Fairmont, The Luxury Collection, JW Marriott, Waldorf Astoria, Autograph Collection, and independent luxury properties such as The Jefferson in Washington, DC and the Five Star-Five Diamond Hermitage Hotel in Nashville, Tennessee.